Women in Egypt. Angry women in fiction. Is it time for a women's Tour de France? Jane Garvey presents the female perspective on the world. Women in Egypt. Emma Pooley on why she thinks it's time for a women's Tour de France. Angry women in fiction with Clare Massud and Joanna Briscoe. How to be an Ambitious Woman - lessons from the Woman's Hour Power List with Heather McGregor. Jamila Abbas on her new app for African farmers. Presented by Jane Garvey. Zora Neale Hurston; Mumsnot; Do Looks Matter At Work? Women were a big part of Egypt’s Arab Spring protests, coming out onto the streets and making their voices heard as they called for a new Egypt. But following the ousting of President Morsi, the country’s first freely elected leader, how have women’s rights progressed? Tens of thousands of protesters have been taking to the streets, and there have been reports of a rise in sexual assault and harassment against women. So has anything changed? 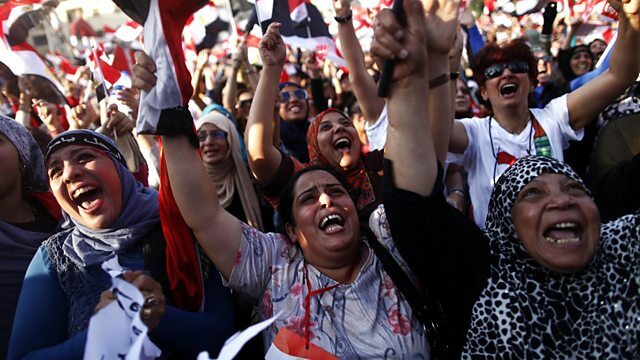 And what does the future look like for Egypt’s women? “How angry am I? You don’t want to know. Nobody wants to know about that.” So says, Nora Eldridge, in the opening sentence of Claire Messud’s new novel, The Woman Upstairs. Nora has always been a good girl – a good daughter, colleague, friend, and employee - but inside she is fuming. Claire Messud and novelist and reviewer Joanna Briscoe join Jane to discuss Nora Eldridge and other angry women in literature. Is it time for a Women’s Tour de France? British Cyclist Emma Pooley has called for a female stage of the Tour de France when the race comes to Yorkshire next year. Why isn’t there a high profile women’s road race? Jamila Abass has designed a mobile phone app which allows farmers in rural Kenya to receive crop prices and market information via SMS. This means that farmers can contact buyers directly, cutting out the middle man and achieving the best prices for their produce. Jamila joins Jane to talk about her work in IT, and how it is transforming the lives of ordinary farmers in Africa. Do women lack ambition when it comes to making it to the top of the career ladder? While men don’t have much of a problem owning their victories, if you admit to being ambitious as a woman you're somehow seen as unfeminine, unsexy, or macho. Women face unique challenges, but are they unlikely to achieve as much as men unless they assume full responsibility for their own success?